This forum is to post your own keyblade master which maybe later used in a RP. Personality:Logan grew up just outside of the castle in the sorrunding kingdom called Kingdom of the Lion. when Logan was six years old an unfortunate accident happend his mother was seduced by greed and became a heartless. During his mothers transformation the former head of the knights tried to rescue her but failed so he took logan under his wing but knew he could not be a knight for he possed no keyblade but when logan turned ten he materialized his keyblade and since then has devoted his life to the study of the keyblade and finding a way to rescue his mother. However on Logan 12th birthday his traing stopped because the former head of the knights the father figure to Logan died while fighting off a Dark Thorn Pureblood heartless. After the former leader was killed Logans true keyblade manifested its self and Logan obliterated the Dark Thorn making Logan the knew leader of the Knights. Keyblade Power: Darkest Night was not logans first keyblade his first was Nightingale nightingale had the ability to control wind and allow the user to ride a small disk of wind across the ground. However darkest night allows the user to control darkness and turn day to night which is when the keybalde is at it's strongest. Character Abilities: Logan is a Keyblade master after he took the Mark of Mastery and passed by defeating a previous Keyblade master on his 15th birthday. He is exceptionally well trained with a keyblade and knows a bit of magic but prefers to use his keyblade. Hair color % style : long ( about the legength of Reiku's ) his hair color is Crimson red and is completely straightend. Apperance : Yin has a slender body with heavily detailed Muscle's jr wears a Black Haori and with a dark red triming to it underneath his haori is a white T-shirt with a Dragon Desgin on it the dragon Desgin seem's as though it's wrapping around him with the dragon's head in the center of the shirt. he wear a pair of black leather gloves. he also keeps his long hair in a pony tail so it doesn't get in his way.he wear a pair of faded blue baggy jeans. Persnailty : Yin is very Honorable loyal and understanding he has a good sense of right and wrong as well as a keen sense on friednship though he is young other masters refer to him as the wisest key blade master yet as well a Proidgey of his time. Power: Yin has studied heavily in elemental magic and holy magic other than that he has unmatched sword skill. Abilties : the Dragon crusher key blade is Zewihander size it's hilt looks like a Dragon's tail and all along the long part of the blade it has a red dragon scale pattern on it the key part looks like two fang's of a dragon. it's power is it grants Yin a immunity to magic as well Launch and allow him to control the element of fire without useing up Mana it's Final Abilty allow Yin to slice through the hardest of metals. Divine Punishment : this key blade is a bright golden yellow make it sparkle in complete Darkness. where Garud would be on normal blade there are two angleic like wing's appearing off of it the key blade doesn't look really anydiffrent from a key other than it's a little shorter than most. it's power is he gain power over darkness & light allowing him to weild these two sub-elements how he please's. Keyblade Power or Abilities: Mysteries of the Heart -- When touched with the keyblade, your true emotions are shown. Also, gives Skye the "steal" ability, so she can steal when in battle. The Night Star -- Darkness can be used when skye weilds this keyblade, and when she uses both of her keyblades, she is able to drain the enemy's health. Mysteries of the Heart: A long keyblade with a violet heart shaped handle (kinda like Kairi's), the end is a heart with little question marks etched all over it. Her main blade is a blue/violet color. 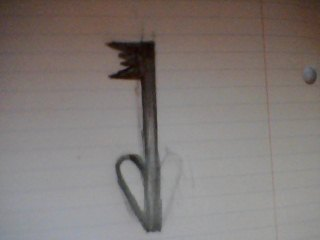 The Night Star: A dark black keyblade with a handle much like Sora's Kingdom Key with blue stars along the blade. The end has a star with Golden stars and light blue hearts. It has a short reach, but both of her keyblades are very light weight. 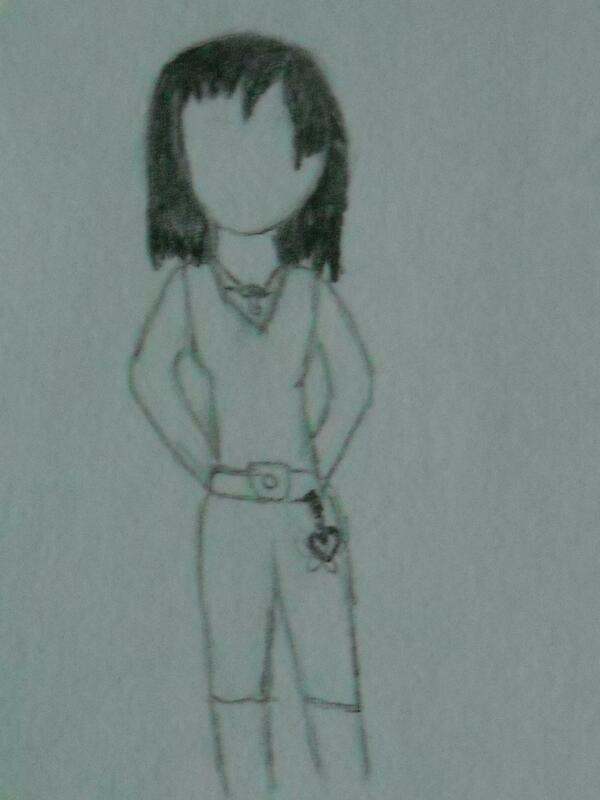 Ok, I'll give this a go, I'll use the character I made for my "Kingdom Spades" fanfic. Personality: Son of Sora and Kairi, Kokoto has grown up to be a very smart,brave, and unique child, for years wondering if the stories of kingdom hearts and the keyblade being true. After the dissapearance of his father, Riku had taken Kokoto under his wing and told him even more stories of the keyblade. but, just when Kokoto thought he had found another father figure, Riku was sucked into the same darkness Kokoto's father did years before.After that, Kokoto and his mother moved to twilight town, in hopes Kokoto would forget the tales of kingdom hearts. but when Kokoto has to fight a strange nobody/heartless hybrid with a strange blade. Kokoto realizes how true the stories of his father truly are, and how much danger the world he loves is in for. Character abilites: Unknown for now. Personality: Very kind and friendly but, falls in love with every cute girl (around his age 13-19) he sees (not Kairi, in fact he thinks she and Sora are dating.) He makes friends easily, but it takes them time to get used to him. Wise, Hates the Darkness and often runs into uncommon heatless like Darksides. Both of his parents were Keyblade wielders. He lived on the main land of Destiny’s Islands His mother died when he was ten after confronting three Darksides in an attempt to save the family. His Father died from an unknown sickness. After that Yin Sid took him in when he was eleven. Drake got his Keyblade on his twelfth birthday. During his Mark of Mastery test he was succumbed by light and earned his Mark afterward he decided to settle in Twilight Town and become a blacksmith (the youngest blacksmith ever at the age of sixteen). But when he met Sora and Kairi he figured it would be best to travel with them. Keyblade Name: he has three Keyblades. His original is the Kingdom Key. Another one is Dragon’s Embrace and the last one is Ends of the Earth. Keyblade Power or Abilities: Dragon’s Embrace allows the user to summon Dragons, cut through virtually anything, allows the wielder to heal faster and move much faster, it is a blue and black Keyblade with fire and sparks around the handle and hearts on the tip. Character abilities: Can Teleport short distances, can fly, has a Keyblade glider and armor (similar to Terra’s and Ventus’s), Mage and Keyblade Blacksmith. Hair: Long, black, with side swept bangs that cover one of her eyes. Personality: Brighter side of life kind of girl. She prefers to be optimistic, or even a cheerful realist, because that's what gets her up in the morning. Izzy has seen and expirienced just how terrible people and life in general can be. Orphaned at six, all Izzy can remember is waking up alone on the dark, rotting streets. She's witnessed first hand the darkest side of human nature. No matter how terrible her life was, however, one tiny spark of light remained in her heart. It was this spark that helped her watch out for the other kids in the street, sharing whatever food or money she came by, even though she wasn't the oldest, and standing up for everyone, even though she wasn't the strongest. Despite her tendency to be a good person, Izzy would have ended up as one of those "ladies of the night" or a slave or probably just dead and forgotten, if she hadn't rushed to the aid of some girl she didn't even know when a vengeful man let himself become a heartless. Izzy had no chance against such a monster, but that didn't stop her from distrating it long enough for the girl to get away. That's when her Keyblade first appeared, giving the street rat of a girl just the smallest ammount of purpose. Now, Izzy travels everywhere, playing the role of mysterious hero, sending what ever money she gets to her friends back home. Her motto is "If something looks too hard, it probably is, but why should that stop me?" Keyblade Power or Abilities: Lighter, longer blade, perfect for Izzy's style of quicker fighting moves. In special circumstances, Free of Heart glows with a bright light, that same light providing Izzy with a pair of wings, while her Keyblade breaks into two identical weapons. This is a very powerful attack, but is doesn't last long, and leaves Izzy completely exhausted. If she still has to fight after using it, she's in trouble. Character abilities: Lacks proper training, but is excellent all on her own. Izzy is a natural Keyblade Master, with a tendency for healing and fire magic. Personality: As the daughter of Namine and Riku, she has a very complex pesonality. She is very kind, and loyal to her friends. She loves drawing, like her mom, but is a HUGE daddy's girl. She tends to be incredibly shy when meeting new people. She considers herself a pacifist who only fight when neccisary. Keyblade Power or Abilities: She can summon beams of lght toshower he enemy. Character abilities: She has a beautiful voice that can stun an enemy long enough for her to escape or attack them. she can also rewrite a persons memories into anything she wants quickly and easily. Character abilities: Can controll any keyblade at will even ones owned by others.Has the power to reverse time and change any ability he has at any time. Position: Bounty Hunter Key Blade Wielder. Personality: Sarcastic, only hunts down the bad guys, a bada**. Character abilities: Nick has the ability to wield 4 keyblades at once. Two float behind him [just like Sora's Final Form (Ruby Light & Star Shower)], while he wields Radiant Light in his right hand and Our Hearts Are One in his left. Has the ability to return Heartless to their human forms. personality: pure evil. yet pretends to help good guys. keyblade: digital world destroyer. the dark destroyer of worlds. keyblade powers: destroys worlds when enough power is gathered. powers:flight, transformation, black magic, great strenth. looks: hair is always covered with a hood, always wheres a jacket, blue jeans, black boots. keyblade(s): death riper and sun sole. 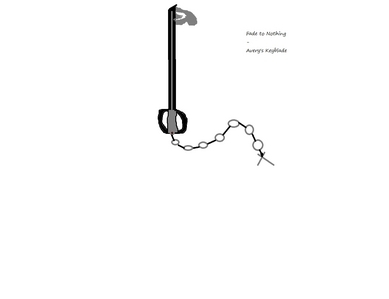 keyblade(s) powers: death ripper can rip apart anything from bosy parts to the persons existence, sun sole can bring back people from not existing to reality, the keyblades are intertwined and never go more that ten meters from each other or the fabric of existence will start to slowly rip open. Absorbs evil from hell and transforms keyblade into a death scythe and kills everyone within a 500 meter radius that is a foe. characters power: can bring forth the evil spirits and becomes the evil demon- Kanahanaor demon of darkness and controller of demon wolves. she is cheerful and seductive. she comes from a world that looks a bit like Land of Departure called Melodious Land. she and her friends are Keyblade Apprentices which learn with their Keyblade Master, Master Viscera. At her spare time, she usually stroll around the city to search for Heartlesses or Nobodies. Sometime she gather with her friends on the hill and practice Keyblade battling, share stories and even dance together. Usually after battling with her friends or her rivals and she wins, she will say, "you're cute, but too bad I must beat you." Ability: Her special ability is Shining Wings. 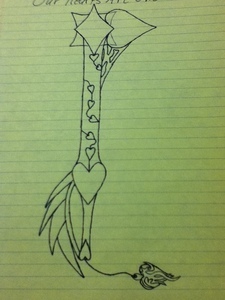 Her Keyblade shoots out a number of sharp butterfly wings and and stab the target. She is very agile which makes it hard to attack her. Age: Looks 19, true age unknown. Personality(please be descriptive): He is quiet and wise. Never showing fear, he is considered emotionless and hallow. However his lack of emotion is a result of his lengthy existence. His knowledge of the keyblades is rivaled by his knowledge of light and darkness. Keyblade Power or Abilities: It separates into 6 different keyblades, which form a ring that hovers around him. Instead of holding them he swings them with simple hand motions and thoughts. The power of the blades increase when the join, Starting at 6, then going to 3, then going to 1. When they all join they are called the 7th hand of fate, a destructive keyblade that cause even deepest darkness to retreat. Character abilities: His immense knowledge of the Keyblades grants him the ability to wield without ever holding them. He only wields the 7th Hand of Fate, which is capable of ripping through even the darkest darkness. History: His existence was known to few, because of how long ago he lived. The only being who knew of Shukuun, was the Keyblade Master Yen Sid. Long Ago, there was a devastating keyblade that many Masters fought over, this blade was called "The Balance". This key was rumored to be able to rip through worlds in a single swing, and that it could remove darkness or light from anyone's heart. While the battle raged, Shukuun watched, shaking his head at the selfishness of the Keyblade Masters. With his 7th Hand Of Fate, he struck down the selfish masters and stripped them of their right to wield their blades. He took "The Balance" and disappeared into the Dark Meridian. He slept there for a long time, only to be waken up by the return of the Keyblades. Personality(please be descriptive): At first very carefree, in the following year after he gained his Keyblade he pursued his childhood friend Nick, who had also gained power over a Keyblade and fallen to darkness. He maintains his facade though, smiling and laughing at everything all the time. He is uniquely clever, often coming up with odd ways to deal with common problems. He feel guilty over many actions he took in pursuit of his former friend, and now seeks to make amends. He believes his life is thoroughly worthless and that the way to atone is to defend others. This as put him at odds with several organizations, as he protects everyone from each other as he deems necessary. But no pursues him though, because of his fighting style and battle experience he has become a dangerous foe to face. Keyblade Power or Abilities: Dawn Raven was his first Keyblade, and he gained it when his world first fell into darkness. It managed to ward the darkness away from him and take him to another world far, far away. There it demonstrated a power to open any locked door, box, and any other areas. Remarkably, this Keyblade can also draw magic into itself and let it disperse harmlessly through the user's body, giving them more power. His second Keyblade, Waking Nightmare, is the result of killing his former friend to put an end to his evil actions. He took up the blade out of regret and summons it in dire straits. This Keyblade was created from a piece of Nick's shattered heart when he first fell into darkness. By itself it demonstrates the same abilities as any typical Keyblade, with the addition that it can amplify all spells the user casts to drastic amounts of power. When used in conjuction with the Dawn Raven, a spell absorbed is transferred through it and into Waking Nightmare, gathering power from the user and either embueing the Keyblade with that spell or launching it outward with great force, effectively redirecting it. Character abilities: Kyle can duel-wield Keyblades at anytime, but prefers to only use one unless he really needs to. His reflexes have become almost as fast as lighting from constantly absorbing spells from his opponents. His strength is slightly above average, but you wouldn't expect it from his small frame. He has an ability to tap into the dawn and access powers from both the light and the dark, though this ability is relatively new and difficult to use and sustain. His hair turns red and his eyes turn orange and for approximately ten seconds he brims and overflows with power. After those ten seconds he is dis-powered and weakened due to his massive exertion. as a result, this isn't an ability that gets much practice or use, typically only the decider or desperate move in a heated battle. Again due to his Keyblade distributing magic throughout his body, he has a higher resistance to magic than a normal human might have otherwise. Personality(please be descriptive):Aaron tries to protect his friends, but he is not very good at protecting against words, or making comebacks against insults. He has put up a mental shield against these to ignore them, but after a while, insults just start getting to him. He takes his anger and sorrow out on heartless, and lesser nobodies. The higher Nobodies that pretend to have emotions, he has a hard time fighting them because of his understanding for them. They only want their own heart, but those who try to use him, such as some upper Nobodies, or other Keybladers, are never forgiven, and are hunted down by him for revenge. Although in actual fighting, he uses the environment so faze his opponents, such as throwing sand at their eyes on a beach. He isn't immune to emotions or his heart though, and sometimes falls to darkness, but always tries to come back up. Keyblade Power or Abilities: The Keyblade Light's Conflicts is a mixture of darkness and light from his world. As a result, he cannot use either light or dark in his attacks, for the power inside cancels each other out. To make up for this, it can unleash very powerful magic, but requires much energy, and succesive uses of this will completely drain him, leaving him almost useless. His energized magic has not been in use much, only being used when he needs to end a fight quickly, or when someone he cares for needs help urgently. It also has another power, the power to destroy light and darkness, in attacks and in hearts. The destruction of either the light or dark will cause the Keyblade to take the destroyed energy and send it into its wielder. Too much of this though, will send the wielder into a frenzy, disregarding everything and simply trying to kill anything, trying to gain more power. Character abilities: His build is bigger than most 14 year olds, giving him slightly more strength than most, but not much. However, his quick thinking allows him to analyze the battlefield easily, picking out weak spots in an enemy, and exploiting them. He can also use a variety of weapons when needed, but he prefers a balance of his Keyblade and magic. Personality(please be descriptive):Evil, Likes to obtain different keyblades and wears a black robe with a heartless symbol on it, he collects hearts and uses them to forge keychains to obtain the strongest key blade in the universe which he needs the hearts of the greatest keyblade masters to make. personality: good, does not know who he is but wields the powers of sora and riku, and is a loner perfers to walk alone where no one will get hurt because of him. character abilities: off hand yamato new how to use a sword and inturn he could use a keyblade. yamato can control both light and darkness. he can summon oblivion and way to the dawn keyblades for his two clones that he can summon and then the fight is over for the opponent and he can create shadow portals to appear anywhere he wants. can summon heartless anytime he wants to aid him in battles. life story: was a created to be the ultimate keyblade wielder and to bring back the x-blade and they wanted yamato to become the king of heartless but something went wrong and when the scientist woke him up at the age of 3 he didn't show signs of wielding any keyblades. but when he turned five he summoned the keyblade oblivion and then he trained till 10 and he summon the keblade called way to the dawn and when he turned 15 he could summon heartless and when he turned 20 he summoned his keyblade and he named it nightmare demon. he became the king of heartless but is on the good-side even though he is tempted to use his powers for evil. this is what he looks like with his third keyblade. you all might know what the keyblades oblivion and way to the dawn look like. Personality: Shadow became a master after his master told him he is too close to the darkness. feeling abandoned, he renounced the light. but that is when a strange man came and talked to him. he then found the strength to face his master. when he went to his master, he was attacked by him and no matter how much he tried to tell him, he finally struck him down. then with his powers of lightning and darkness, he healed his master and told him of what he has learned of the darkness. finally a keyblade master, shadow was the first one to be able to use darkness without it getting close to corrupting him or weakening him. Keyblade power and abilities: it can see what your heart really desires, and can shoot lightning and shadow bolts from the tip. can create shadow golems for protectors. can seperate into 2 different keyblades; lightning's justice, shadow's truth. Character abilities: natural imunity to the darkness, can summon golems with or without the help of his keyblade, but its easier with it. can shoot lightning and control it, and make it from thin air. can spark life in to beings with none left in them. History: shadow was cast from the World That Never Was because of his strange powers. 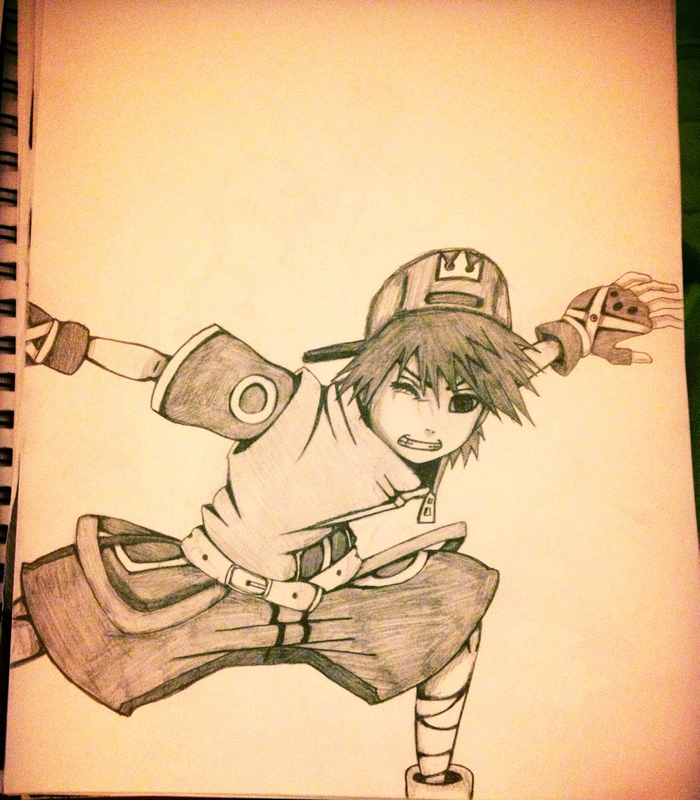 he floated around until he landed onto a keyblade master training ground and learned from the greatest master there. he then set off to search for more answers to unlock his abilities, and in hope of finding more keyblade masters or wielders and lead them there. but he was attacked by Nobodies and Organization XIII, and held captive to be used for his abilities. when he finally broke free, he landed into the Realm Between, and was a sort of Oracle for those brave enough to search for his help. 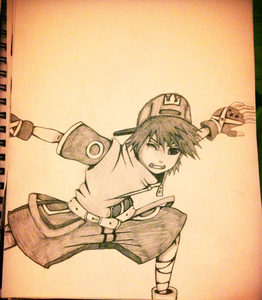 until he saw how a man with flames in his hands give his life for a boy with a keyblade. then he went off and saw the beginning of a new war. a war with which he will help the light, with the darkness. Personality: Kibou's family was attacked and destroyed by a force at the age of 5. An attackers spirit that died against his parents told him to become strong or die by their boss's hands. Kibou left his birthplace, Radiant Garden, for revenge at age six. He met many people and became their friends, but they fell a week after they met him by the same force. By age seven, he became distant towards everyone and never had friends. By age ten, he had defeated the great evil that had turned his life to hell, with the attacks against him and the killing of his friends and family. He grieved for his family and friends until he turned 12. The keyblade presented itself to him when he gotten over his grieving. To this day, he fights heartless and nobodies to destroy the evil that brings turmoil to others lives. Keyblade's Power and abilities: The Lone Wolf Keyblade has equal magic and strength power with a long reach to land strong critical hits. It's ability is boosting all magic based attacks and, while strongest under a full moon, brings unstoppable blizzards that break through even the most durable defenses. Character Abilities: Kibou can use his keyblade just above apprentice level, even if he learned under his own guidance. He can sync blade, but only with Kingdom Key, and Rumbling Rose. He is more prone to magic, like aqua, and less strength, like Terra. He practice mostly with Thunder and Blizzard attacks than anything else. His strongest attack is Thunderstorm, where lightning and hail rains from the heavens. He can transform into Valor, Wisdom and Anti-form. Command forms are Spellweaver, Diamond Dust, and Thunderbolt. 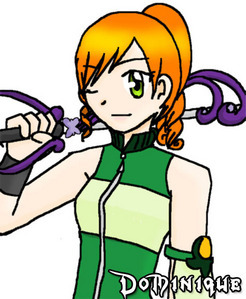 Personality(please be descriptive): She was born in Radiant Garden and was trained by a keyblade master there. When Radiant garden was attacked she was offered a spot in the organization when she was 5. 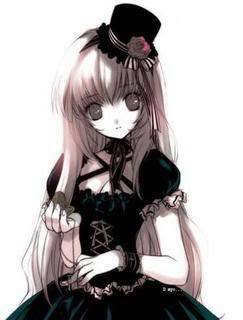 (She was young but very intelligent) Sadly Asea invited the darkness into her heart and she only had a little light left. Axel became her only friend in the organization because all the others were jerks to her because she was so young. (Which explains why Axel has a soft spot for Xion and chose her over Roxas as Saix said) Axel helped her keep the light and told her to leave. She left and found sanctuary on Destiny Islands where she met Riku When they were both 7. He told her that light always is stronger than darkness. That little piece of advise led her on her way. She found Yen Sid and he helped teach her how to hide the darkness and become immune to it, while hiding her from organization 13. She soon was able to hold her Keyblade strong and fight the darkness to keep her light. She met Riku later and they became friends because they both had been affected by the darkness and had become immune to it. She has a secret crush on Riku but can't show it although Kairi tries to hook them up. Her personality is part Quiet, keeps her cool, but not afraid to be crazy once in a while. She is a little bit Sora and a little lot Riku. She is secretly related to Kairi since Kairi grew up in Radiant Gardens. They are cousins both of their parents were killed. Keyblade Power or Abilities: She can use her limit break earlier than most because she trained early and her main Command is Gravity drop. Character abilities: She can release the darkness of ones heart once in a while and make them pure and forgiven but she is wiped-out for days after wards. She has flash forwards occasionaly but can't make sense of them. She can make people remember their memories located deep inside the heart. Because Kairi is her cousin and Namine is Kairi's Nobody, Namine and Asea are Kind of Opposites. She has a Mysterious Past and doesn't tell anyone about it. If you have any questions or if you wanna know how she met Riku just Reply back and I will answer! Personality:He is cocky but calm. He also like's to show off his skills and has a secret training system that helped him become a stong battler. Even though he's cocky, he's very quiet andit seems like he's been meditating or something to clear his mind, but he actual thinks about his parents and the day they were murdered. He set out to kill the murderer and avenge his parents, which when he did, his keyblade formed from his anger. Keyblade Powers/Abilities: This Keyblade was formed by anger, so this blade is very destructive. When the wielder calls upon Chaos, he strikes the blade into the ground and releases a wave of energy that eliminates all foes. When he calls upon Peace, it heals all wounded allies as he raises his blade into the air. Character Powers/Abilities:The wielder's abilities are connected to the blade's abilities. Chaos and Peace are the blade's abilities. When the wielder calls upon War, the blade doubles in size and power and it also splits in two. When he calls upon Order, he splits into five of himself. War and Order are related to the blade's abilities. 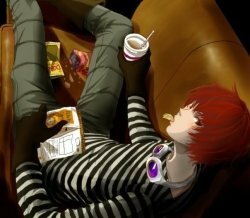 Hair : Normally Black But it's Red When unconscious and Pale White when he dies. 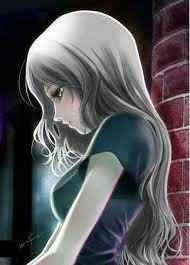 Position: Heartless Master/Heartless/ Friend of Sora. Personality: Quiet and Not noticeable. He never cared or loved or anything a normal person does. He couldn't talk or never wanted to. Hates the Organization 13 Especially Xemmas a.k.a Terra. Keyblade's Powers or Abilities: Twin Flare can product a large amount of fire at the heat of 10000 Degrees Fahrenheit. Leon was born with these Keyblades, so only he can unlock their full potential. If you notice "Twin" in Twin Flare and Flash, these keyblades are not fully created yet . Twin Flash can Massive Thunder Storms in Seconds. No one can use these keyblades. When Leon fuses these keyblades together, the name is Infernal Lighting. Character abilities: He can create heartless whenever he wants to fight for him. he can move faster the the speed of light and Fly. He has massive amount of intelligence about keyblades and heartless. History: When i was born, i was born with a curse called half heart, and a key blade call Brokenness. Xemmas cause the curse on me because when Aqua tried to bring Terra back, It was too late and Terra turn into Xemmas. 10 Years later Xemmas was pulled into Halloween town Because Xemmas and I was born with the same curse but effected them differently. Xemmas saw my hair was pale white like his. Before my name was Leon, Xemmas wanted to kill me before i killed him, but he saw my true name XXXX . The rest of the story was a blur to me but i'm sure Xemmas remember it. Personality:He is arrogant and cocky,but he is serious when he needs to be.He is very cautious about weilding the x-blade and tries not to do it frequantly. History:Avery was just a kid in the world of Midgar when the heartless invaded.He materialized Fade to Nothing and fended them off. After years of dealign with his alter ego. He beat, and merged hearts with him forgeing the x-blade. Avery then decided he would try to live a peaceful life and he only battles major battles..but there is the common gam stop employee he scares to get free stuff. The sword of revenge make the foe feel what the master feels in pain loseing a love one or death a vvery good illusion if the belive it is real it will happen. Personality: Quiet, Emotionless , Evil, and Merciless. He doesn't show emotion unless he sees someone frightening or threatening to him. And when he is attacked he shows his true colors. Keyblade Power and Abilities: Takes the souls of the defeated opponents, Summons Soul Beast of Many forms. It can make copies of the wielder from the souls collected into the cursed Keyblade, The Keyblade drives its wielder insane, the wielder attacks everything in sight with every more powers it gains.Truly a cursed Keyblade. History: Shade was a normal child until disaster struck, his hometown was attacked by heartless countless of them appeared, he sees the people he loves die before his very eyes. knowing his weakness he desired power. The heartless Attacked him but, an unknown voice rings in his head "Do You Want Power, Power to Destroy them". Shade answered "Yes". Then A Keyblade appears before him he used it but when he wield it, his eyes turned crimson red. The Keyblade controlled him he defeated the heartless easily. Some of the survivors from the attack approach him but, Shade Strike the man and (usually the heart was taken but, this keyblade steals souls) His was taken and Imprisoned in the Keyblade. Shade attacked the others and then fainted when he awakens he sees everything was gone his home, his love ones, everything taken. he realised that he had done this. he then was driven insane by the Keyblade he wield. He then sets out to collect more souls until he destroys everything. History Part 2: Shade Wielder of The Cursed Keyblade wandered aimlessly collecting souls, destroying places. Until he met a girl that has the same past as him while he is sane he would let the girl join him. Her name is Minako. Shade then finds another town. Shade who was determine to destroy the world Charge the town. Minako chased him to the town where she saws Shade killing the townsfolk. Minako saw the ruthlessness of Shade tries to stop him. Minako can calm people down by using magic. Shade then collapsed. Minako took him to a save place. shade who wakes up to dark place meets a dark figure. He said "Good Job, Shade". Shade confused and frustrated strike the figure with the Keyblade. The figure said" You've mastered the Keyblade, you have improved". Shade ask who is he. The figure said"The Time will come when you know, The souls you collected is sufficient". Another Keyblade appeared before Shade. "Here is reward for your efforts". Shade then Wakes up and sees Minako. I don't know if this will be of use without any pictures ... but it seems fun. Personality: Very secretive and likes to be isolated from the world. If anyone got to know her, they'd find that she was actually really, really nice and selfless. She yearns for friends that can save her from the Curse- a Darkness disease that eats away at the heart. Though she should really belong in a subject called In-Between, it does not exist, so she can side with neither light nor darkness, so everyone suspects her to be a spy. Keyblade Powers: It can cause monsters called the Abyss to surround enemies and plunge them to wherever it hurts most: the Realm of Darkness, or Castle Oblivion. It can also create a portal known as the Endless Hallway, which is only accessable by someone of neither Light nor Darkness. Eclipse's Abilities: She can call upon the Abyss to aid her, create a portal called Endless Hallway, and create cages made of chains of Light and chains of Darkness. If her true abilities are ever unlocked, she will be able to transform into three different forms; Ultimate Form, Desperate Form, and Unstoppable Form, all of which are very powerful. Personality: Quite calm and cool. Always quick to crack a joke even at his own expense. He has learned to use his laughter as a shield so nothing really hits him at the intensity that it should have. The only thing that he has showed sorrow over is his close friends dying as a result of playing right before the battle of a 100 heartless in the pit that it took place. Keyblade Powers: Because of his disdain for fighting he often uses his keyblade's special ability. When he does decide to partake in battle he wields his weapon backhand, As its the only way he can truly use his keyblades special ability since he is right handed. Esawk levitates his keyblade so he can access all of the musical instruments on it at once. When all of the instruments are played at the same time it allows him to control all his foes that hear the sound. Those of which he is not controlling get dazed and confused allowing him to kill half an army with heartless with the other half and then betray those that served him. 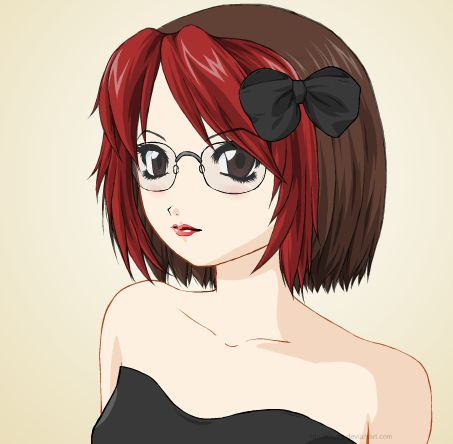 Personality(please be descriptive): Very quiet and shy, bubbly, adorable, pretty, kindhearted, forgot some of her memory's, sweet, brave, can be feisty, (just don't make her mad) can be a little devil, loves to laugh, hilarious, makes everyone else laugh, is like a little sister or the baby of the family to everyone, and a a skilled fighter. Keyblade Power or Abilities: It can summon wolves, manipulate shadows and darkness, and possesses a great strength. History: Grew up on Destiny Island, doesn't exactly remember how she got there, and pretty much had the same thing happen to her just like Sora. Personality: Tobias is calm and socially awkward boy. He like to keep to himself always watching the other kids play and form friends. At first he looks mean but when you really get to know him he is a kind person just looking for a place he belongs like everyone else. History: Tobias has never been a chooser and his combat style reflects that as well. He uses a mixture of magic from both light and darkness. Like his Master always told him Light is not good and darkness is not evil, A true keyblade master can use both in equal pairs. But because he tends to stay close to darkness, after his master past way nobody would name him master. So he became master in his own right by mastering both Light and Darkness not trying to sway towards one over the other. While in the realm of the in between Tobias stumble upon a force that almost blended in with the surrounding. It was a keyblade that was born in neither the realm of Light or darkness. The design is identical to the original Kingdom Key but it's only colors are white and black. Character Abilities: Affinity Shifter changes the power of user and keyblade depending on what force is near them. Position(if they have one): Leader of the Cherry Blossom Organization, and is also a Gatekeeper to happiness, something that powers the light. If the happiness is stolen, there will be no light. Personality(please be descriptive): As a child, Yuri was a princess to a royal family. One day, a plague swept over the kingdom. Her parents, the king and queen, were killed, leaving Yuri, her brother, Yukito, and younger sister, Rikku, to rule the kingdom. She ran away when she was 7 to a different world. The world she ended up in was Twilight Town. There she met her best friends, Syaoran and Hikaru. Heartless were everywhere. Syaoran wields a black katana and Hikaru wields many daggers. On Yuri's 12th birthday, they were all attacked by a huge Groundshaker. Syaoran and Hikaru all most died. That is when a keyblade appeared in her hand. Her anger consumed her and she anniliated the Heartless. The boys had bad wounds. The reason the key popped into her hands was because it chose her, to help protect her friends. The same night, in a dream, she was told how the keyblade came into existince, why it chose her, and what she had to protect. She has a dark side. Whenever someone dear to her is hurt, she goes black. Black Yuri. She is sweet and caring to loved ones, not the nicest person to strangers. When she goes black, there is no stopping her until she gets what she wants. The day she got control over the keyblade is when they all decided to create the Cherry Blossom Organization. They vowed to help anyone that has be hurt by the Heartless or the Nobodies! Keyblade Power or Abilities: It has the power to create any element from nothing, like fire, water, air, earth, light and dark. It can, if you are positioned in the right way, emit a sphere of light around you like a forcefield or send a beam of light into the sky and light the whole area around it. It'll drive off anything from the darkness. It will also open the door to happiness, an endless paradise, free from darkness. No other keyblade can open this door. Character abilities: She can, when she is angry, use just her body to defeat and destroy anything that gets in her way. She can also bend the 4 elements (got that idea from Avatar: Last Airbender. all credits go to them!). Depending on her mood, she can change the weather to whatever she pleases it to be. She knows alot of curses and hexes. Personality: out going, headstrong, knucklehead, funny, motivator, open minded, fun, and can be stubborn and aggressive to handle and he always follows his dreams/goals. I`ll try Name:X Age:23 Height:6`7 Eye color:Scarlet Hair:Spiky Brown Mohawk Position:Sora`s Brother Personality:As Sora`s older brother,X had a orphanage life until Sora was born. On his 8th birthday he took Mark of Mastery and passed with a ancient move called "Seige Reign". Now,he battles at Master Yen Sid`s Training Facility. Also,he is a apprentice to Xehanort. But,now ever since Xemnas pushed X into the "Dark Temple Amor",X got a new and powerful keyblade called "Slender`s Chaos". 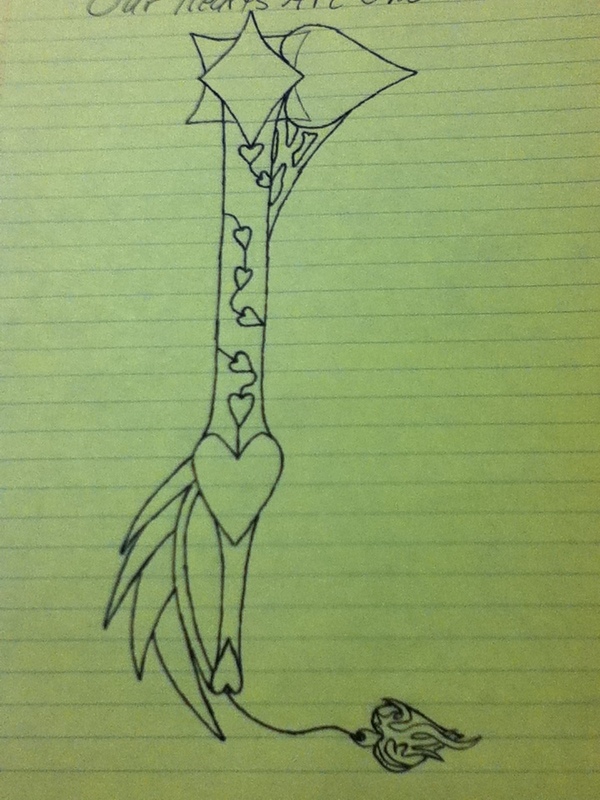 Keyblade Name:Slender`s Chaos Keyblade Power or Abilities:Can heal the user every 5 seconds,gains Strength and MP every 9 minutes,turns into a gliding Amor cloud. Character abilities:Can diguise as one of the Organzation XIII and tackle down Organzation XIII members,rides Amor cloud to confuse his enemies. 2nd Personaliity:Escaped the "Dark Temple Amor" with his Amor cloud from Slender`s Chaos,and lives with Sora. Unforunately,Xehanort,Ansem,and Xemnas took X`s heart to the "Dark Pit of Misery",and X is now fighting in his dreams. But,X`s heart escaped the "Dark Pit of Misery" and returned to X. With Xehanort still mad,he thinks of a new plan.